Rebecca Taylor introduced the main speakers of the July 20, 2015 FPHPS Open Meeting , Peter and Cathy Meyer with ‘Coastwalk North Carolina‘. Rebecca first met Peter when she was a New Hanover County librarian and Peter’s best-selling Nature Guide to the Carolina Coast was regularly stolen from the library by discerning patrons and regularly replaced by library staff as a must-have reference volume. Peter and Cathy have extensive knowledge of the North Carolina coast, and the Nature Guide is filled with photographs, drawings, and information on the flora and fauna of the region. Several years ago, Cathy proposed that the couple walk the entire length of the North Carolina shoreline. So, over the course of 18 months, the Meyers walked every bit of the North Carolina coastline (with the exception of off-limits Browns Island at Camp Lejeune), from South Carolina to the Virginia border: 425 miles of coastline along 21 barrier islands. 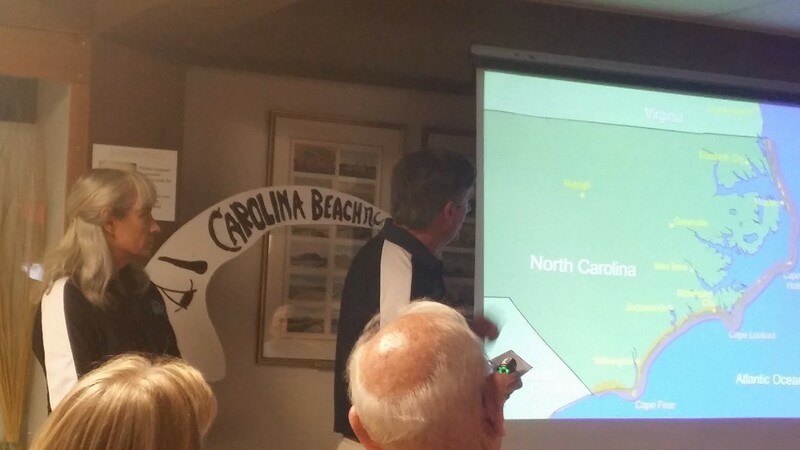 The Meyers’ knowledge and appreciation of the Carolina coast was evident in their Coastwalk experience and presentation. 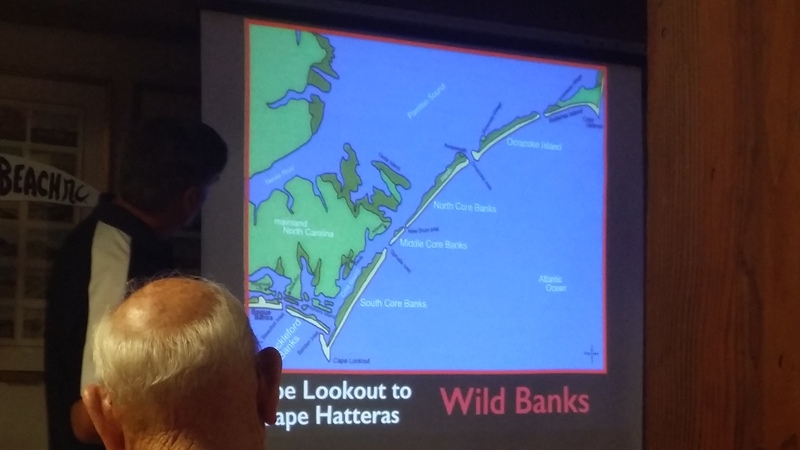 Their talk, incorporating both photographs and videos of the shoreline wildlife they encountered, as well as maps and diagrams detailing the logistics of how they completed sections of their walk, was varied, informative, and made several important points. Third, beaches should not become piles of rocks. They should be allowed to be the wide expanse of sand they are naturally, serving as barrier islands. The presentation ended with a lively Q&A session. One of the young people in the audience asked if they considered doing a coastline walk from Florida to Maine and Peter answered that it was up to the questioner’s generation to make that walk. Passing it forward!